Local and cloud-based trusted key creation, delivery and authentication services including optional hosting, operation and maintenance of CryptoManager Secure Infrastructure for secure SoC and device manufacturers, as well as downstream application developers and service providers. 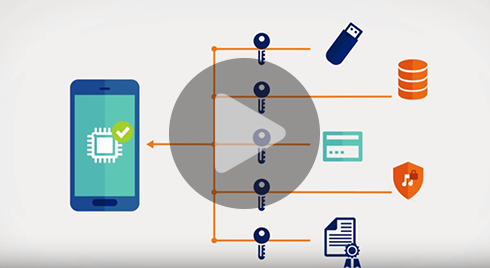 A key component to the CryptoManager Platform, our trusted provisioning services enable improved security for SoCs, devices and secure applications by providing a trusted path for sensitive data throughout their lifecycle. This sensitive data can include cryptographic keys and configuration settings to enable application security; personalization information for applications, devices and users; and application, device, and service features; as well as other forms of sensitive information enabling device life-cycle management and robust on-device security services. The CryptoManager secure in-field provisioning capabilities are based on trust established early in the manufacturing process through integration with the CryptoManager Security Engine as a robust on-device root-of-trust. This enables a complete cloud-to-silicon full-lifecycle security ecosystem that provides a new level of protection for devices in the field, and fundamentally changes the way that trust is established and managed for mobile devices and applications. A number of high value mobile application segments are dependent on strong device-side security to manage risks and enable mobile application services businesses. These applications include mobile payments, smart ticketing, content protection, and other applications requiring strong identity, security and trust. With the prospect of multiple trusted applications which, in turn, require support from a mix of trusted stakeholders within the mobile ecosystem, the need for a unified, secure, and trusted provisioning platform has become essential. Via a software agent that runs in the trusted operating system or the high-level OS when the hardware core is not present, endpoint security for in-service devices and other devices that lack a hardware core. Secure provisioning infrastructure provided as a cloud service – hosted infrastructure option for service providers focus on rapid time-to-market and low upfront investment. Comprehensive cloud service for customers who prefer to consume the CM Infrastructure for secure provisioning as a service rather than a product. Hosts, operates, and maintains all components of the CryptoManager Infrastructure, allowing application developers and service providers, to leverage the trust and security of CryptoManager without having to own and operate provisioning infrastructure. Includes tools allowing easy integration of access to the cloud service into existing customer backend platforms for key provisioning and feature management of applications.